Eden Hall was proud to sponsor a series of fine wine diners in Shanghai this month, working with T8 Restaurant, Singapore’s The Tippling Club, Kurow Winery (Waitaki, NZ) and Pasquale Viticultura (Hakataramea, NZ). Working with T8 chef Adam Liston and guest chef Ryan Clift from The Tippling Club in Singapore, Eden Hall wines were matched to three stunning menus for three distinct events – a media only luncheon, the “Twisted Table” 18 course degustation VIP dinner and finally, an eight course degustation dinner for T8 regular customers. T8 is highly regarded worldwide, with Conde Nast magazine rating it in the world’s top 50 restaurants. Chef Adam Liston, formerly of Adelaide’s Melting Pot and The Wine Underground, is turning heads in his new role as T8’s executive chef, winning numerous local awards for his inventive and visually stunning cuisine. 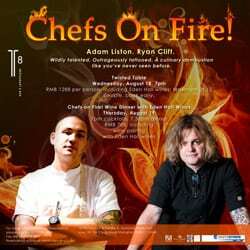 Into the mix was thrown the amazing Ryan Clift, owner and chef of Singapore’s The Tippling Club. Previously Melbourne based at Vue de Monde, Ryan Clift has revolutionised fine dining with a passion and emphasis on the de-construction and re-construction of ingredients, flavours, textures and visual presentation. There is no better way of capturing the essence of his cooking than by stating that through the use of advanced food technologies – think of de/rehydration, emulsification, distillation and liquid nitrogen for starters – Ryan Clift cooks for the 5 senses. The Twisted Table menu (see attached with supporting images) was an adventurous exercise, given the somewhat inconsistent behaviour of the kitchen equipment, the language barrier (only Adam’s sous chef “Frank” speaks English among the 15 staff on the T8 kitchen floor) and the incredible heat (temperatures in the kitchen regularly hit 55C! ), besides the many other unforeseen problems that eventuated. The event maintained a strong Australian flavour with many of the ingredients, the wines and the chefs themselves sourced from these shores. The audience response to the Eden Hall wines was all that we could have wished for and more. “It is about time that wines of such quality made it into Shanghai,” remarked “That’s Shanghai” Food and drink Editor Justin Fisher. “This style of Riesling is what I love’. And this type of observation was made frequently about the quality of Eden Hall’s wines and their packaging. The Shanghainese have developed an incredibly sophisticated palate, no doubt heavily influence through exposure to classic French cuisine and wine culture. This is not a market that is easily pleased or wowed with culinary ‘smoke and mirrors’. They have very high expectations and are regularly exposed to the best the world has to offer – dining on the Bund was an eye opening experience to how far Shanghai dining has evolved. Think eastern influenced cuisine served by young Shanghainese clad in uniforms expected of Manhattan or Paris; our maitre d at the cutting edge eatery “Mr and Mrs Bund”, welcomed us wearing a purple suede waistcoat and red Converse Chuck Taylor high cut sneakers! The attached menus and photographs give a glimpse of the events hosted at T8 restaurant and it was a thrilling platform from which to launch the Eden Hall brand in China. There is no better way to convince an international audience of the quality of fine wine and dining experiences on offer in Australia. We look forward to working with our Sales and Marketing Manger, Genevieve Prior, to establish the Eden Hall brand within the established fine dining culture within Shanghai and Hong Kong. To that extent, we have begun planning our next promotional event in conjunction with Pasquale Viticultura from New Zealand – a series of “Australia VS New Zealand” tastings and dining events to coincide with the Bledisloe Cup fixture in Hong Kong in late October 2010.